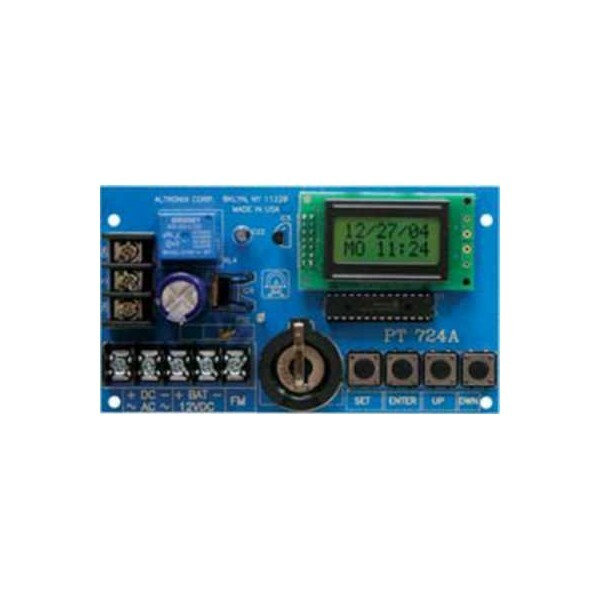 Models TA-2624 are extremely versatile 24 Hour 365 Day Event Timers designed to support a wide range of applications: Home and Building Automation, Security, Access Control, Lighting Control, Etc. 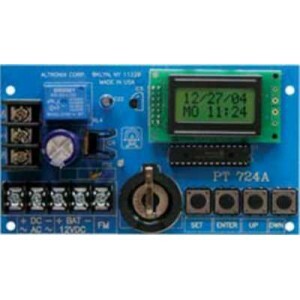 TA-2624 are equipped with an independently controlled form “C” relay contact that provides many latching and/or momentary operations during a program schedule of your choice. Events may be set for single or multiple operations on a daily and/or weekly schedule. • Standby current: 10mA (relay off) 50mA (relay on). • Battery charging current: 100mA. • Form “C” relay contacts are rated 10 amp @120VAC/28VDC. • Accurate crystal controlled clock. • Block programming capacity can accommodate a total of 350 events per week. • 10 programmable Holiday dates. • “First man in” option. • Built-in charger for 12VDC sealed lead acid or gel type batteries (Max charge current 100mA). • Lithium battery backup maintains clock (optional). • Product weight: 3.3 lbs.